In a previous post I wrote about Rosamond Warren Gibson’s mother, Annie Crowninshield Warren (1815–1905), drawing upon Annie’s Reminiscences of My Life. For this post I want to return to Annie and her Reminiscences, and this time relate two incidents Annie describes that she seems to have taken some pride in. On both of these occasions, which took place little more than a year apart, Annie claimed that her stubbornness saved the lives of her family. According to Annie, on the first occasion the family avoided being killed in a serious train accident and on the other, avoided drowning on a sinking ship. Nearly 400 people on board the Arctic perished after a collision with the steamer Vesta, which had set out from Quebec during foggy conditions. Only thirteen people, including the Arctic’s captain, survived, and they were later put on board the Warrens’ ship and returned to Boston. I think it could be said that these two incidents suggest something important about Annie’s character, or her perception of herself. In describing these two moments in which she and her family only narrowly escaped tragedy, she emphasizes her stubbornness as the key that saved their lives. It may be that she took great pride in what she perceived as her independent mindedness. Annie reveals how much she valued this personality trait, demonstrating that at times it could prove of great benefit to her loved ones (even if here good fortune, rather than Annie’s stubbornness, was responsible for her family’s survival). Annie Crowninshield Warren, Reminiscences of My Life (privately printed, 1910). 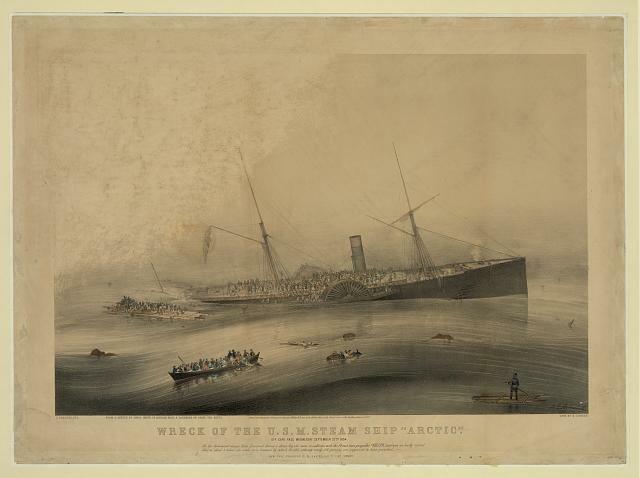 “Loss of the Steamship Arctic, Appalling Loss of Life,” Brooklyn Daily Eagle, October 11, 1854, Brooklyn Public Library database, http://bklyn.newspapers.com, accessed March 20, 2016. 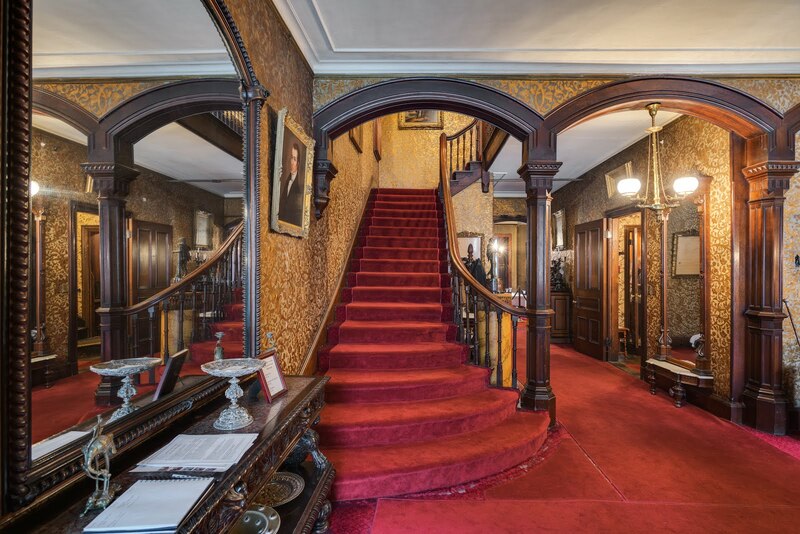 The Gibson House was designed by noted architect Edward Clarke Cabot and was meant to exhibit both Victorian and Italian Renaissance style. As was common in nineteenth-century townhouses, the kitchen was located in the basement, where servants would prepare food and deliver it using a dumbwaiter. A dumbwaiter is a small elevator used to deliver food between the floors of a house. It lifts items using a pulley system, in which rails guide ropes in between floors. 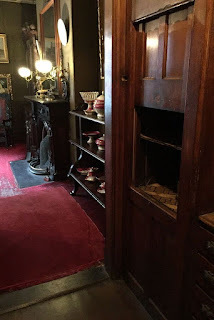 The dumbwaiter in the Gibson House rises from the kitchen to a small pantry on the first floor of the home, where the “good” dishes are stored. The food would be sent up in covered kitchen bowls, then transferred to the appropriate china and taken into the dining room to be served. 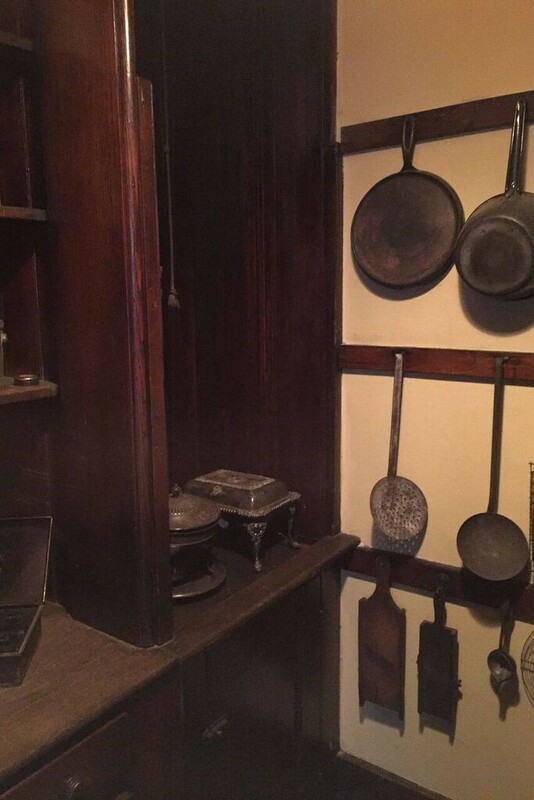 The dumbwaiter evolved over time, improving technologically. Notably, Thomas Jefferson, although he did not invent the dumbwaiter, made significant improvements to the design. Jefferson built dumbwaiters into the sides of the fireplace in his dining room at Monticello that were specifically used to serve wine. During meals, a slave in the wine cellar could use the dumbwaiters to send bottles of wine up to the dining room, and at other times the dumbwaiters could be concealed behind their closed doors. In 1883, George W. Cannon improved the mechanical dumbwaiter and patented the design in 1887. The mechanical dumbwaiter first became popular among the upper classes and soon spread into average homes. 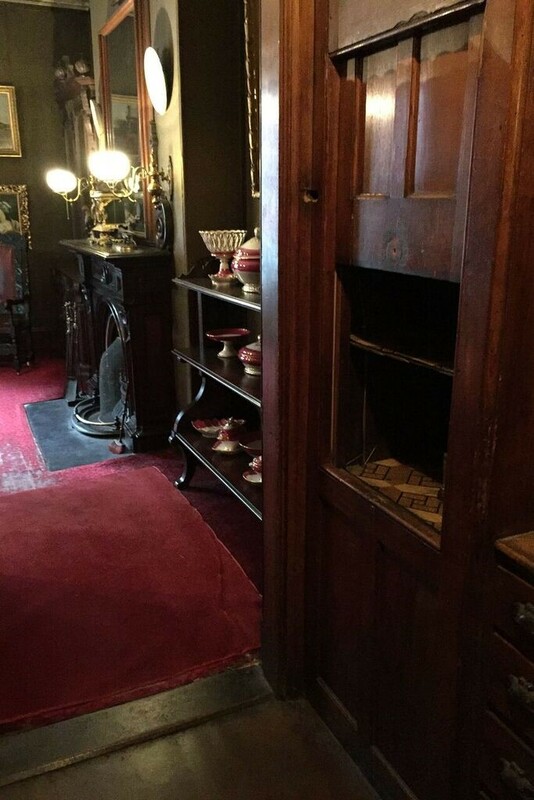 Today, the dumbwaiter still exists in older homes such as the Gibson House; however, in order to be used for its designated purpose it is required to be adapted to modern-day building codes and construction regulations. "Design and Decor--Convenience. Monticello. N.p., n.d. Web. 22 Mar. 2016. <https:/www.monticello.org/site/jefferson/design-and-decor-convenience>.